A comforting & delicious gluten-free and vegetarian butternut squash lasagna bursting with muenster and parmesan cheeses, sour cream and your favorite marinara sauce! Lasagna is my comfort food; and it was only recently that I discovered the wonderful addition that butternut squash is to an already delicious staple . . . Growing up as the only vegetarian in my family, my mom would always make me my favorite cheesy lasagna for Thanksgiving. Now, I realize it isn't all that common, but she would often use sour cream instead of the standard ricotta cheese; and let me tell you: it is delicious. I just cannot have it any other way. If you've never tried it, you're in for a treat! It really imparts a ricotta texture with an even better flavor. Throw in some butternut squash and some muenster cheese (it really complements the squash! 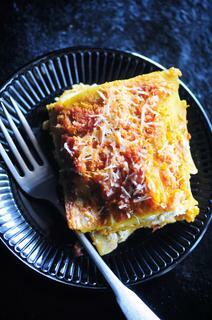 ), and you have one of the tastiest vegetarian lasagna's you've ever had! Trust me; this makes for one indulgent and supremely tasty autumn pasta dish. I definitely look forward to hearing how you like it, too . . .
Preheat oven to 375°F.Grease a casserole dish or square pan (dependent upon shape of lasagna noodles used). Set aside.Mash cooked butternut squash with nutmeg; set aside.Smooth one layer of marinara sauce in bottom of prepared pan.Place one layer of three lasagna noodles on top of sauce.Smooth another layer of sauce on top of noodles.Next, place one layer of 2-3 slices of muenster cheese.Using half of your container (4 oz), place spoonful dollops of sour cream over your muenster cheese. Next sprinkle one layer of parmesan cheese.Place your next layer of three lasagna noodles.Smooth one layer of half of your mashed butternut squash.Sprinkle some garlic powder and italian seasoning over squash layer.Top with a layer of parmesan cheese.Place your third layer of lasagna noodles followed by: sauce, remaining muenster cheese, remaining sour cream and a layer of parmesan cheese.Place your final layer of lasagna noodles. Top with: remaining sauce, remaining butternut squash, a sprinkle of garlic powder & italian seasoning, and one last layer of your remaining parmesan cheese.Place into your preheated oven (uncovered) and bake for 35 minutes or until the cheese is melted and the edges are turning golden. Broil for 1-2 minutes if you like your lasagna top and edges a little on the crispy side (we do! ).Remove from the oven and let cool/set for at least 10 minutes before slicing and serving. Enjoy!